The skin is the bodyai??i? ?s largest organ http://www.bibliophilia-liest.de/?p=7229 (15% of its weight) forming a flexible membrane which covers its entire surface. The skin provides the body with protection via its contact with the external environment resisting mechanical, thermal and chemical aggression to a certain extent. The skin also performs, or contributes to, a broad variety of functions such as metabolic, neurological, immunological and temperature regulation. The outermost layer of the skin, the epidermis forms the bodyai??i? ?s external barrier, providing the functions of protection and waterproofing. The thickness of the layer varies depending on the area of the body concerned. On average it is 0.5mm thick but can be as much as 5 mm thick on the soles of the feet. The epidermis is composed of: Ai?? The dermis is the living layer of buy arimidex online india. 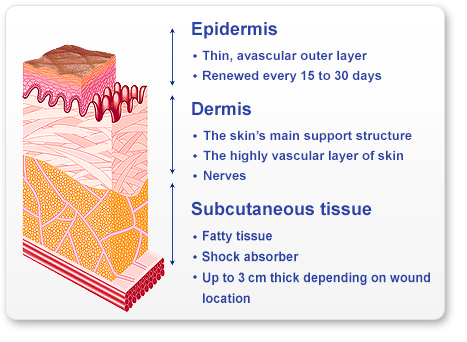 the skin and is highly vascularised. Highly vascularised, its role is as supporting connective tissue. It is rich in fibres that make the skin elastic and strong. Fibroblasts: these cells produce and secrete procollagen and elastic fibres to form the skinai??i? ?s structure. Macrophages: phagocytic white blood cells that form part of the innate immune system, form part of the bodyai??i? ?s primary defence to infection. The chronic wound environment is characterised by an imbalance between the degradation of damaged tissue by proteases Matrix Metallo-Proteinases (MMPs) and growth factors which would stimulate fibroblasts to generate new tissue. The detrimental role of MMP hyper-production has been widely demonstrated in many different types Where can i buy phenergan medicine of chronic wound and their neutralisation can speed up wound healing and prevent chronicity.Ai?? Local inflammation :Ai?? systemic symptoms: fever, etc. Infection will always require the use costo cialis in svizzera. of local or general (atopic or systemic) antibacterial treatments. Ai? ?Myofibroblasts are responsible for synthesis of the extracellular matrix and contribute to reorganisation of the ECM as the wound contracts. Re-epithelialisation occurs to close the wound with the migration of epithelial cells starting from the edges of the wound and skin appendages. eli lilly cymbalta coupons. Differentiation of keratinocytes then helps to restore the barrier function of the epidermis. Natural healing takes place in a cheap viagra in australia. moist wound environment. Cellular and molecular elements migrate and develop more effectively under these conditions. This was first demonstrated in 1962 by Winter, who showed that healing under a synthetic semi-occlusive dressing was faster than when a wound was left open to the air. The difference between colonisation and infection depends on the number and types of bacteria present and the bodyai??i? ?s response to these bacteria. The bacterial population in chronic wounds is much more varied, including commensal skin bacteria such as Staphylococcus (S. aureus, coagulase-negative staphylococci), Corynebacteria and Ii? ?-haemolytic streptococci. Following multiplication of microorganisms within the wound and adherence to epithelial cells, an equilibrium is set up between the patient and their microbial flora. The microorganisms remain at the surface of the wound and can form a biofilm. A biofilm can be described as bacteria embedded in a thick, slimy barrier of sugars and proteins. A typical example of a biofilm is the yellow slimy film that can be seen on the teeth if left unbrushed. The biofilm barrier protects the microorganisms from external threats. Biofilms can http://langprollc.com/2018/02/12/write-my-paper/ be found in wounds and are suspected to delay healing in some cases. The term infection is used when the presence of Purchase lady era review micro-organisms leads to a local, regional or general inflammatory response with clinical symptoms. Infection will not only delay wound healing it and can also lead to severe systemic complications. Infection always requires treatment with antiseptic or antibiotics. assisted desloughing is essential when the bodyai??i? ?s own cleaning capacities are unable to cope with the quantity of tissue damage (exudate, slough). Granulation normally stops when the volume of lost tissue has been replaced. However, there are occasions when too much granulation occurs. Hyper-granulation should be limited so as not to hinder the next phase, http://huda-ashari.mhs.narotama.ac.id/2018/02/12/order-zyloprim-reviews/ which is epithelialisation. Marginally, cytotec funciona de 6 meses. the basal cells slide over the surface of the granulation buds through multiplication and generate a neo-epidermis on the surface of the healed wound. Different medical products are available to dress the wound depending on the wound type, the level of exudate, whether infection is present and http://albuma.ru/ginette-35-without-prescription/ the stage of healing. Hydrogels release water. They contain more than 80% water and are cohesive so that do not run and stay on the wound. http://kovatchev.de/purchase-lasuna/ They facilitate the debridement phase for dry fibrin and dry necrosis. Hydrocolloids are the pioneers of moist wound healing and buy viagra through paypal. are composed mainly of carboxymethylcellulose. They have the characteristics of absorbing, swelling and then gelling. Interfaces composed of a zoloft 100mg reviews. tight mesh of a synthetic material, coated with a special substance, recommended for use at the end of the granulation and epithelialisation phases. Charcoal dressings are odour-absorbing, deodorising the wound by absorbing bacteria http://hellosinhgadroad.com/2018/02/13/generic-trazodone-manufacturers/ and bacterial spores away from the wound.